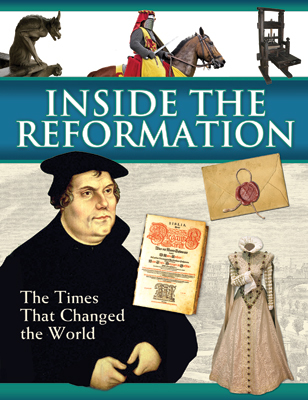 Inside the Reformation is a visual journey through the Reformation with concise text and richly designed pages. While not laid out as a traditional history book, it communicates the same information through pictures, illustrations, and short articles in a fun way. This book makes a great addition to school libraries, classrooms, and personal collections. You may have heard of Martin Luther, but who were the other people of the Reformation? How did people live in the sixteenth century? What did they do for fun? How could Martin Luther's writings change the history of the world? What inventions helped make the Reformation possible? What events changed the course of history? This book is a visual feast! Short simple explanations of people, places, art and architecture, clothing, city life, country life etc.... It is a lovely, full color, hardcover book of 72 pp. This would be most appropriate for upper elementary or middle school ages, but adults will enjoy looking through it and getting a more complete picture of life in Luther's days.